Learn the art of fine shirt making from a prize winning fine shirt maker. NOTE: This is a class for intermediate to advanced sewers. Students MUST be familiar with reading a pattern, adjusting tension, "taut" sewing techniques, and in particular, precision sewing. For students lacking mastery of these skills, take the Casual Shirt Making class first. What is a fine shirt? It’s a classic dress shirt made with the traditional and best construction methods used by fine tailors around the world. We take a typical shirt pattern and elevate the construction techniques to the highest level. You will learn techniques not found in consumer patterns – techniques that are found only in the most expensive custom-made dress shirts. The techniques you will learn will elevate your garment construction skills and can be applied to other garments. This is an intensive five-section class with additional work required outside of each class to complete a fine shirt. Students must use an appropriate instructor-approved pattern, which we will alter for fine tailoring techniques. A supply list, pattern requirements and pre-class instructions will be provided upon registration. Students at Bobbin House Studio have the option of taking one or all sections, however regular class and mentoring fees apply if registering for only one section. Discount rates apply only when registering for two or more sections at time of registration. Each section is a three hour class or two hour mentoring session. The series starts with an overview of how to modify a commercial pattern for fine tailoring techniques as well as materials and supplies used in the process. Learn the mysterious technique of "bagging the yoke" and tips for making perfect flat felled seams and beautiful rolled hems. Learn tips for making crisp, flat, sharp-cornered pockets with perfect top stitching. Assimilate techniques for pucker-free plackets. Master sleeve modifications for a professional-looking encased armscye as found on fine dress shirts. Learn to make cuffs that naturally roll around the wrist and join the sleeve perfectly. Additional tips include making traditional sleeve plackets, matching patterns and simple custom modifications. 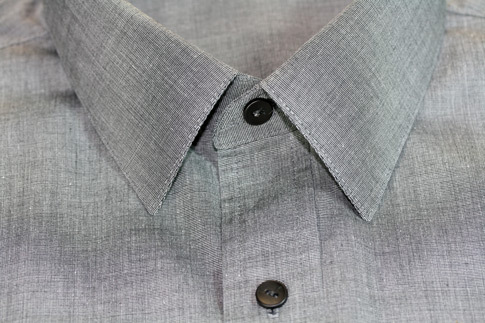 Finish your shirt with the symmetry of a beautiful 3-way rolled collar that naturally holds its shape. Learn how to join the stand to the collar and shirt body with perfect seams - no lumps, bumps or bulges. Discover creative ways to use buttons and button-holes. Learn tips for button placement for best fit, using your machine to securely sew on buttons and how to size and make durable good looking button-holes. We will wrap up the series with a review of the sections and a discussion on how the various techniques can be applied to making other garments.